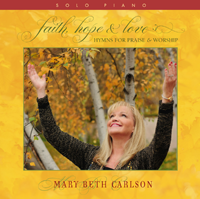 "a healing sense of serenity, joy and well-being"
... just some of the words listeners are using to describe the captivating piano orchestral music of Mary Beth Carlson. Each of her albums will lead you through a peaceful journey of comfort and contentment, leaving you relaxed and refreshed. Mary Beth creates a consistent flow throughout her recordings with an elegant, beautifully distinctive style that has become a best selling "signature sound" throughout the country. Mary Beth passionately plays from the heart, whether it be romantic pop standards, inspirational arrangements, or original compositions inspired by people who have touched her life. Accompanying Mary Beth's indelible artistry are carefully selected Oscar winning film score musicians and world class symphony and recording artists. Selections are skillfully orchestrated with a variety of intimate ensembles including guitar, flute, oboe, soprano sax, harp, violin, cello, acoustic bass, and light percussion. The result is a breathtaking array of musical color, texture, and emotion as the orchestration gently decorates the featured instrument, the piano. Each piano orchestral album features an hour or more of music to relax, refresh and inspire; a uniquely beautiful treasure you will want to experience and share over and over again. Faith, Hope & Love is a brand new solo piano recording of time-honored hymns and a praise and worship song, "What a Beautiful Name", that has become very meaningful to Mary Beth. Each refreshing, creative new arrangement passionately played from the heart invites the listener to meditate on God's unfailing faithfulness, healing hope and deep, abiding love. Every selection was carefully crafted to provide a call to worship reflecting the message in the music. 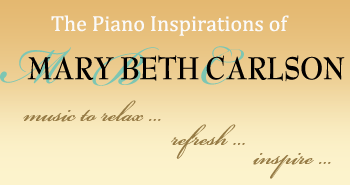 "Soothing, relaxing and refreshing ... that's what Mary Beth's music does for my heart. Her beautiful music inspires me as I create my designs." "Having had the opportunity to share the stage with Mary Beth, I admire the powerfully spiritual and emotional depth of her music and her performance. She creates a uniquely warm and intimate connection with her audience ... a talented, charming, extraordinary performer!" "Feel-good, soothing...beautiful, well-crafted...definitely qualities of Carlson's music."